Toona australis F. Muell. -> Toona ciliata M. Roem. Toona australis (F. Muell.) Harms -> Toona ciliata M. Roem. Toona ciliata M. Roem. var. australis (F. Muell.) K.N. Bahadur -> Toona ciliata M. Roem. Toona microcarpa (C. DC.) Harms -> Toona ciliata M. Roem. Toona microcarpa (C. DC.) Harms var. denticulata A. Chev. -> Toona sinensis (A. Juss.) M. Roem. Toona microcarpa (C. DC.) Harms var. grandifolia Chev. -> Toona sinensis (A. Juss.) M. Roem. Toona longifolia (Wall.) M. Roem. ex Harms in Engl. & Prantl. -> Toona sinensis (A. Juss.) M. Roem. Toona serrata (Royle) M. Roem -> Toona sinensis (A. Juss.) M. Roem. Toona serrulata (Miq.) Harms -> Toona sinensis (A. Juss.) M. Roem. ENGLISH : Philippine cedar, Philippine mahogany. BENGALI : Tuun (Tun), Tuni. BURMESE : Mai yom horm, Taung tama, Taw thamgo, Thit kador . CHINESE : 红椿 Hong chun, 小果红椿 Xiao guo hong chun (as T. microcarpa). ENGLISH : Australian cedar, Australian red cedar, Australian cedar, Burma cedar, Burma toon, Harms red cedar, Indian mahogany, Moulmein cedar (Myanmar), Queensland red cedar (Aust. ), Red cedar, Toon. FRENCH : Cèdre rouge, Cèdre rouge d'Australie. GERMAN : Australisches mahagoni, Australisches Zeder. HINDI : Lud, Mahanim, Tuun (Tun), Tuni. MALAY : Suren kapar (Java), Suren mal (Java), Surian limpaga (Sabah), Ranggoh (Sabah). SANSKRIT : Nandi, Nandika, Tunnah (Tunna). TAMIL : Agil, Cevvagil, Karansuli, Mala-vembu, Santhana-vembu, Thevatharem, Tunu, Tunumaram. THAI : ยมหอม , Yom hom. SYNONYM(S) : Soymida febrifuga (Roxb.) A. Juss., Swietenia febrifuga Roxb. ENGLISH : Iron redwood, Vietnam mahogany. FRENCH : Cèdre du Vietnam. VIETNAMESE : Lát khét, Xương mộc. Soymida febrifuga (Roxb.) A. Juss. is the current preferred name for this species but Soymida is not yet entered into our database. CHINESE : 香椿 Xiang chun (Cantonese Hsiang tsun). ENGLISH : Chinese cedar, Chinese mahogany, Chinese toon, Chinese toon buds, Chinese toon leaves, Chinese toon shoots, Red toon, Tree vegetable. FRENCH : Acajou de Chine, Cèdre de Chine. HINDI : Daaraluu, Darli, Darloi, Darlu, Durla. MALAY : Suren (Indonesia), Surian bawang. VIETNAMESE : Tông dù, Hương xuân. Photograph of spring foliage at Fiorella Gilli in Italy. Photograph 1 of spring foliage at Esveld - Holland. 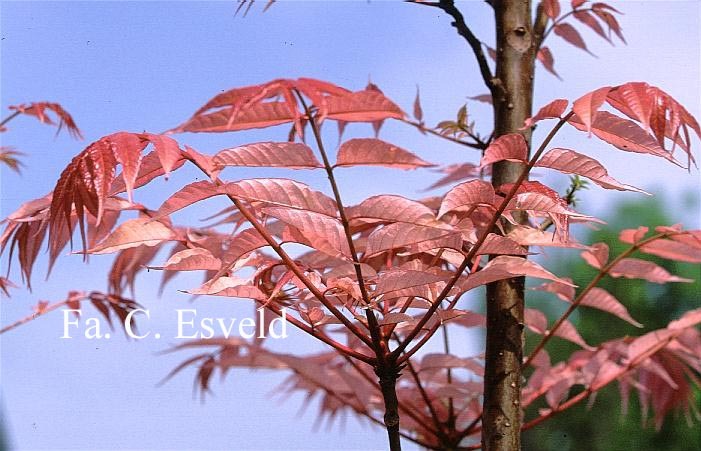 Photographs showing seasonal foliage colour variations at Esveld - Holland. Photograph of spring foliage in China. Photographs of bark, leaves & buds in Hong Kong. 2 types of Chinese toon : Purple Chinese toon ("young leaves and buds are a purple or dark red color, the skin is gray brown, the branches stretch out. The young shoots are strongly aromatic, rich in lipid, less fibrous") Green Chinese toon ("The plant stands up. The skin is green gray. The young shoots are less aromatic and contain less lipid"). Ref: Oriental Vegetable Seeds 2005 Catalogue. < http://www.agrohaitai.com/others/chinesetoon/chinesetoon.htm >. FRENCH : Cèdre flamand rose. CHINESE : 红楝子 Hong lian zi. MALAY : Suren (Indonesia), Surian wangi. Porcher Michel H. et al. 1995 - 2020, Sorting Toona Names. Multilingual Multiscript Plant Name Database (M.M.P.N.D) - A Work in Progress. School of Agriculture and Food Systems. Faculty of Land & Food Resources. The University of Melbourne. Australia. Hải Thượng Lãn Ông , VIỆN THÔNG TIN - THƯ VIỆN Y HỌC TRUNG ƯƠNG. Lê Thánh Tông - Hà Nội - Việt Nam. < http://www.lrc-hueuni.edu.vn/dongy/index.html >. Latin index / search : < http://www.lrc-hueuni.edu.vn/dongy/search.plx >. Hồ Ngọc Đức , 1997-2004, Từ điển tiếng Việt - The Free Vietnamese Dictionary Project. < http://www.informatik.uni-leipzig.de/~duc/Dict/ >. ICRAF, 2005, International Centre for Research in Agroforestry (ICRAF), Agroforestree Database (project is funded by DFID (the British Department for International Development) and EU(European Union)). < http://www.worldagroforestry.org/Sites/TreeDBS/AFT/AFT.htm >. Lemmens, R. H. M. J. et al., eds. 1995. Timber trees: minor commercial timbers. Plant Resources of South-East Asia (PROSEA). MPCPDB , 2005, Medicinal Plant Conservation Parks Database. Tamil Nadu. < http://mpcpdb.frlht.org.in/ >. Tables index : < http://mpcpdb.frlht.org.in/Nomenco.htm >. Pornpitak Panyarat & Wangworn Sankamethawee, 2000-2005, List of plant names: Huai Kaeo Arboretum, Chiangmai, Forest Herbarium (BKF), National Park, Wildlife and Plant Conservation Department, Bangkok, Thailand. < http://www.dnp.go.th/Botany/Gardens/Hueykaeo_list.htm >. Wiersema, J. H. & B. León. 1999. World economic plants: a standard reference.